The Trade Unionist and Socialist Coalition (TUSC) in Newcastle-Under-Lyme is appealing to trade union members, anti-cuts campaigners, young people – everyone in fact who opposes the Con- Dems’ austerity agenda. 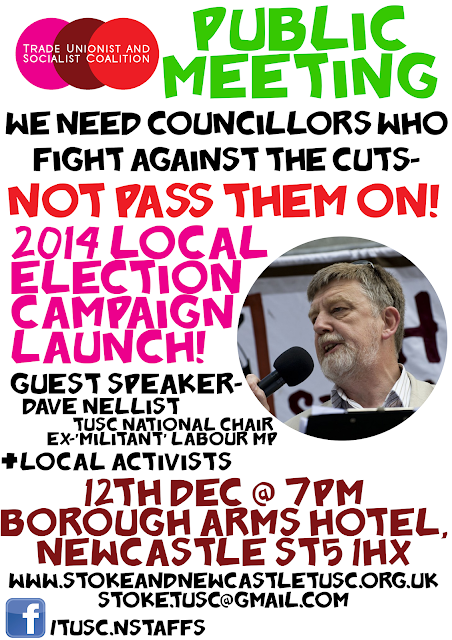 Are you prepared to support local councillors who will refuse to vote for cuts? Or even be a council candidate yourself? Con-Dem austerity is affecting every part of our lives. From pensions to tuition fees; the bedroom tax and low wages; our NHS and libraries; Sure Start centres and support for people with disabilities. A fight back is needed but not a single council – Tory, Lib Dem and Labour alike – has said no to the cuts. It is not true that councils have ‘no option’ but to pass on the Con-Dems’ cuts. If just a handful of councils defied the Con-Dems and refused to vote for cuts the government could be made to back down and fund public services properly. Individual councillors have a choice. The Trade Unionist and Socialist Coalition has a policy platform for local council elections which could make a difference. Even one councillor taking a stand, if they used their position in the council chamber to appeal to those outside, could give confidence to trade unionists and community campaigners to fight. This platform is the basis on which any prospective council candidate can stand under the TUSC name in local council elections. We encourage every trade unionist, anti-cuts campaigner, community activist and all those who want to see an alternative to the establishment parties to become a TUSC candidate. We intend to stand as many candidates as possible in Newcastle next year, but to do that we need your help. To this end, we have organised a public meeting at the Borough Arms Hotel in Newcastle on the 12tf of December at 7pm with TUSC national chair Dave Nellist (ex 'Militant' Labour MP for 9 years) as a guest speaker.